Fig. 1—This is a glorious depiction of the evil labyrinth we have discovered. 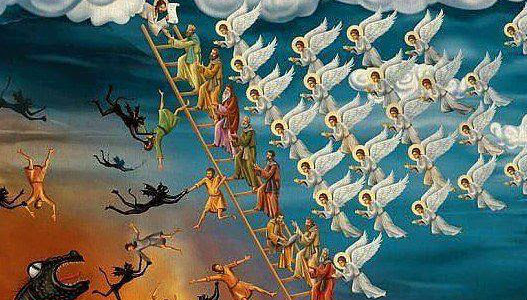 The Icon of the Ladder of Divine Ascent is connected with the well-known spiritual classic book entitled The Ladder of Divine Ascent by Saint John Climacus, of the seventh century. It inspired by Jacob's dream where God—the Great I Am—promised to keep him in all places and that he should not be afraid. Genesis 28:12-15. (Apr. 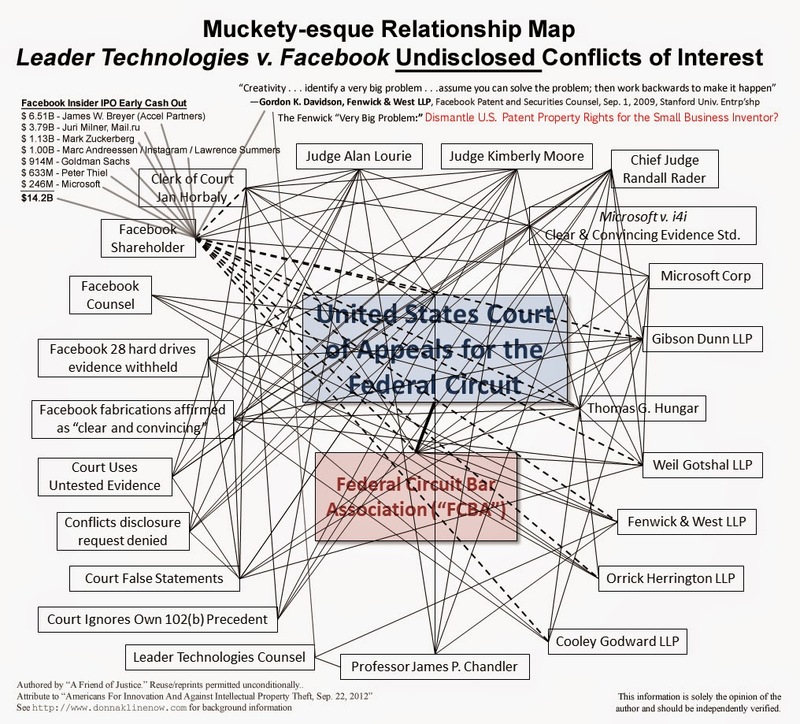 20, 2018)—AFI began this investigation in 2012 to try and understand why the U.S. Supreme Court failed to protect Leader Technologies’ revolutionary invention of social networking—even after Leader proved that Facebook infringed their patent on 11 of 11 claims. 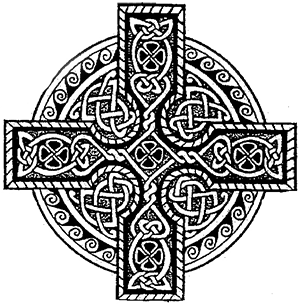 What we have discovered is a labyrinth of organized sin and corruption that permeates practically every institution on our planet. 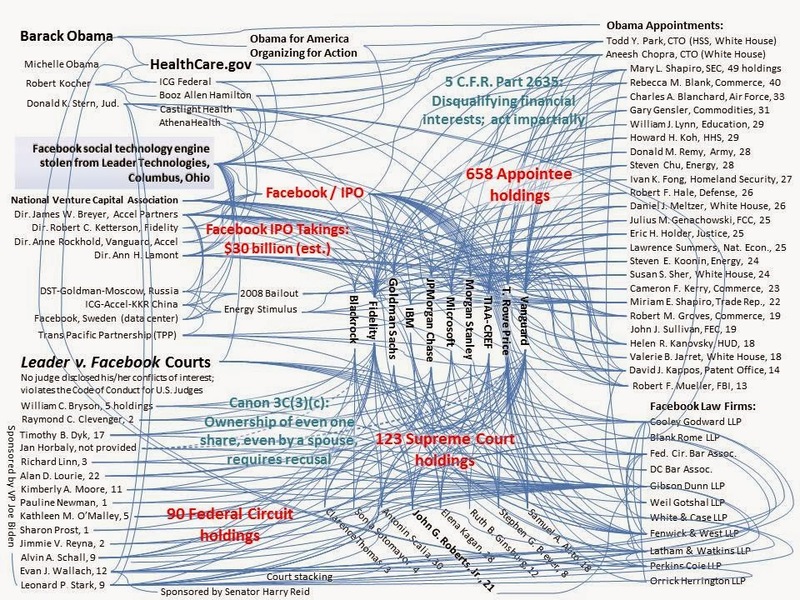 Besides watching the Leader v. Facebook court ignore well-settled precedent so that they could protect Facebook, the judges themselves held volumes of Facebook financial interests. 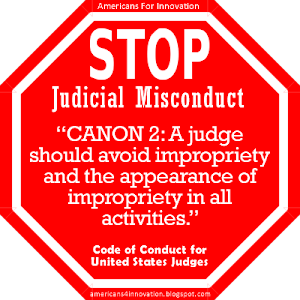 Judges are expressly prohibited by their sworn Code of Conduct from engaging in such immoral and illegal activity. They are prohibited from holding “even one share” by a spouse in a litigant. 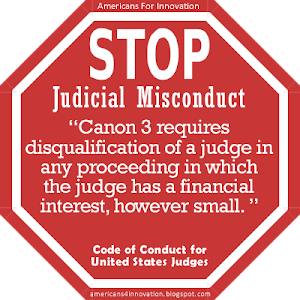 The games that our judges, politicians and bureaucrats are currently playing by hiding their financial holdings in large corporate litigants behind conspiring mutual funds is just obscene. This corrupt practice began in earnest after a Judicial Conference in March 2001—six months before 9/11 & the theft of Leader's social networking invention—without public hearing or debate. We call it The Great Mutual Fund Scam. 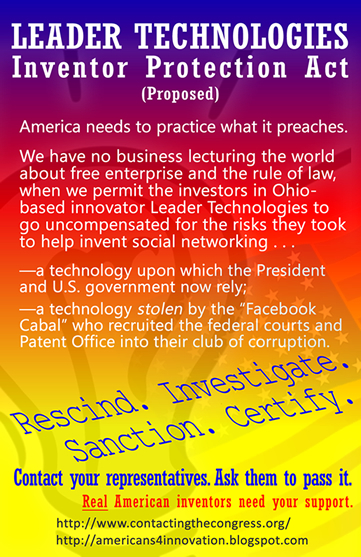 Leader Technologies’ shareholders are currently asking President Trump to pay them for the 18-year theft of their social networking invention by the federal government and our rogue Silicon Valley technology community. They have filed “Miller Act Notices” at the White House and have proposed a remarkable non-tax $500+ billion new revenue source and a Win-Win fix for the horrific problems that this theft has caused. See Leader Technologies files trillion dollar bond lien on the U.S. Fig. 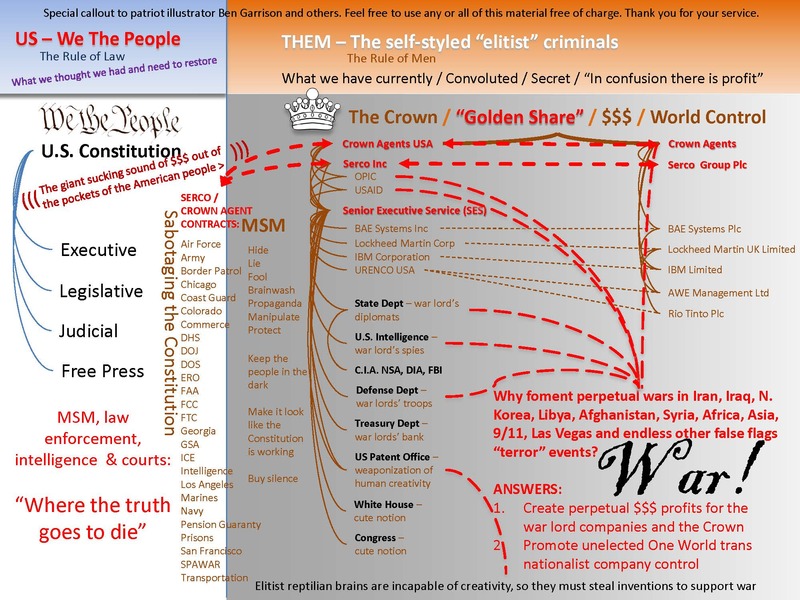 3—Constitution vs. Crown: This flow chart shows who, what and why perpetual War! is the goal and need of the Deep State shadow government. Click here for a PDF of this illustration. What is the connection with Leader Technologies’ social networking invention? 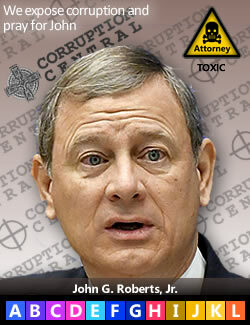 These corruptocrats stole it because they knew it would speed up their takeover of the American Republic. They appear to have been right about that. “Social networking” appeared almost overnight like a Phoenix via the IBM Eclipse Foundation in early 2004 once Leader Technologies had finished debugging their source code. See First annual IBM EclipseCon 2004, Feb. 2-5, 2004 (Facebook started Feb. 4, 2004). For new readers unfamiliar with the Leader Technologies story, we have added a footnote overview of the Leader “innovation magic” story below so that we can get to the main theme of this post. Once we proved the immediate evidence of the Leader v. Facebook corruption, we widened our lens aperture to look at who and what was behind these peoples’ choices to be so corrupt. 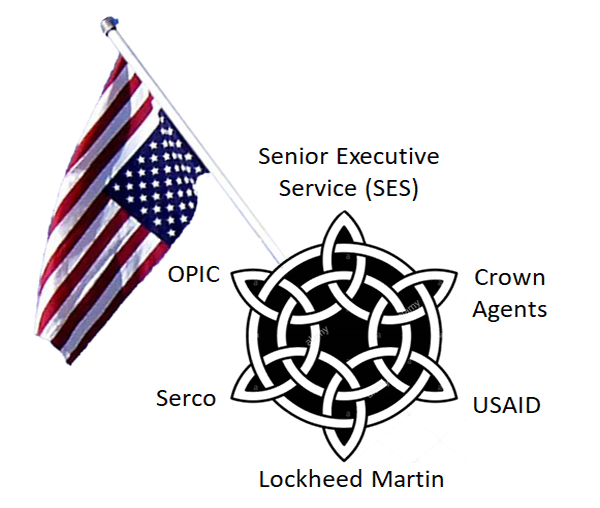 We knew a little about Lockheed and USAID, but nothing about SES, OPIC, Serco or the Crown Agents. Considering that these organizations move hundreds of billions of dollars of American tax money around the planet, why are they not in our civic consciousness? The MSM has been silent and has clearly failed to hold them accountable, as is their job. Now we know that this gaggle of criminals are the successors of Nazi Brown Shirts for the Deep State shadow government. They could cease tomorrow and the world would only improve, wars would stop, and a new era of human creativity will be unleashed. SES & OPIC constitutes an unconstitutional secret government of war profiteers, but it’s worse. Other governments help drive this SES / OPIC bus to perdition. Fig. 4—WAR PROFITEERS: The SES, OPIC, USAID, Serco, the Crown Agents and Lockheed Martin operate a border less, corporatist, globalist economy where national sovereignties are obliterated. Flying the American flag upside down is an officially recognized signal of distress, not disrespect. The Senior Executive Services (SES) includes over 8,000 Obama stay-behind senior federal employees in all agencies of the U.S. government. They openly state that they cannot be fired by the President, which means they are not accountable to our Republic and have a law unto themselves. 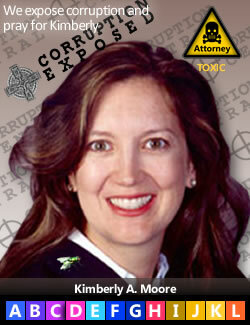 See our previous post Obama hired them. Trump cannot fire them. So they say. It went viral 30 days ago with an estimated 500,000 views. The story is out. 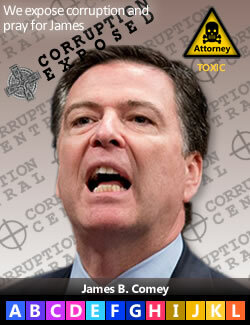 Former FBI Director James B. Comey’s book title speaks volumes: A Higher Loyalty. Evidently Mr. Comey believes his oath to serve America does not include its leaders if he decides to have a globalist agenda. His associations with Lockheed Martin and London-based HSBC clearly show that he leads this coup against American sovereignty. The arrogance of his current book road show speaks volumes about his moral character. Connecting the dots, AFI, Leader Technologies, American Intelligence Media (AIM) and other researchers from groups like The Right Media, Anonymous, the real Q and KimDotCom among them have helped uncover primary institutions through which the SES-OPIC funds its sedition (we believe)—totally outside of We The People Congressional oversight. The Overseas Private Investment Corporation (OPIC) was formed on January 19, 1971 in an amendment to the Foreign Assistance Act of 1961. The Act had previously formed the United States Agency for International Development (USAID) which is closely aligned with OPIC’s seditious activity. OPIC is actually a corporation whose sole shareholder is the U.S. Secretary of State. The SES provides the executive staffing and leadership for OPIC. Note that the Crown Agents in the UK adopted an identical organizational structure in 1995, see below. 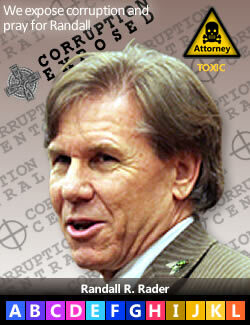 Herein is the scandalous scamming of America. Through convoluted legal gobbledygook, OPIC as a company and not a federal agency per se is solely “owned” by the Secretary of State. OPIC is staffed by the SES who state openly that they cannot be fired by the President, and therefore by direct inference don’t work for him—even though the President appoints the Secretary of State, their sole shareholder. As if this could not get more twisted, the Secretary of State is an SES member and technically cannot be fired by the President, who works for We The People. This likely means that We The People have no control over SES or OPIC—even though we fund them both. The lawyers who wrote these laws and regulations (and then protect these entities from FOIA transparency) should be shot for this treasonous word play. While Rex Tillerson recently left his position as Secretary of State, being SES himself, we doubt he was fired. Just look at how Attorney General Jefferson B. Sessions—also SES—is stubbornly hanging on, almost begging the President to challenge his SES employment protections. Fig. 5—The SES Plum book claims that the President cannot fire them. S. Prt. 114-26. (Dec. 01, 2016). 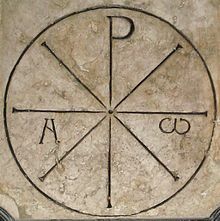 Plum Book, Policy and Supporting Positions. Committee on Homeland Security and Governmental Affairs. U.S. Senate, 114th Congress, 2d Session, p. 218 (PDF p. 228). GPO. OPIC’s 2017 Annual Management Report says they have provided $23.2 billion in benefits to recipients worldwide—all decisions made by the SES. Conclusion: SES-OPIC has been a rogue outfit ever since the SES was formed in 1978. 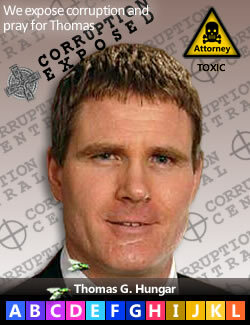 This article will discuss prominent people involved in globalist activities, worldwide. The more our investigators dove into the seditious SES-OPIC labyrinth, the deeper it went, and the more convoluted it became. Serco is led by a British knight and the son of one. Both men have pledges oaths of loyalty to the British Crown. They are Sir Roy Gardner, and Rupert Soames OBE (Order of the British Empire), son of Sir Nicholas Soames, grandson of Winston Churchill. 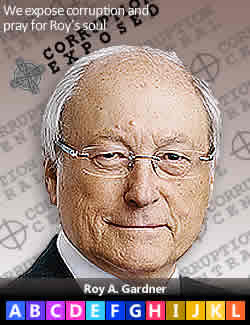 Sir Roy Alan Gardner (born 20 August 1945) is a British businessman and Chairman of Serco. He was knighted in 2002. 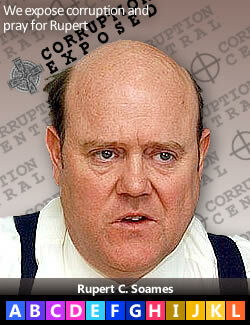 He was also managing director of GEC Marconi Ltd. Rupert C. Soames OBE (born 18 May 1959) is a British businessman and CEO of Serco. He was awarded an OBE (Order of the British Empire) in 2010. He is the son of Sir Nicholas Soames, and the grandson of Winston Churchill. British Oath of Allegiance to the Monarch: These men have pledged oaths of allegiance to the Queen substantially in this form: “I, NAME, do swear that I will be faithful and bear true Allegiance to Her Majesty Queen Elizabeth, Her Heirs and Successors, according to the Law. So help me GOD.” Some British citizens consulted discount these awards by the Queen as somewhat meaningless, while others did not. The point to be made here is less about opinions on royal orders, and more about whether these men take seriously their oath to Queen and God. It is certain that British courts consider these oaths to be legally binding. Since these are binding legal oaths, it is certain that they run Serco, and its subsidiaries in America, with loyalty to the Queen over the U.S. Constitution. These oaths are similar in principle to swearing to tell the truth so help you God before testifying in court. See Promissory Oaths Act 1868. (Jul. 31, 1868). 1868 c. 72 (Regnal. 31_and_32_Vict). Legislation.gov.uk. Fig. 7: Sir Roy Gardner and Rupert Soames lead Serco Group Plc and its subsidiaries around the world in total allegiance to the British Crown. "Serco is the biggest company in America that you have never heard of.” Why? Why is a company that operates the U.S. Patent and Trademark Office and over 58 air traffic control system in the U.S. so obscured from the public consciousness?! Serco Group PLC is a British company with 10,000 employees and annual revenue of $5.9 billion. 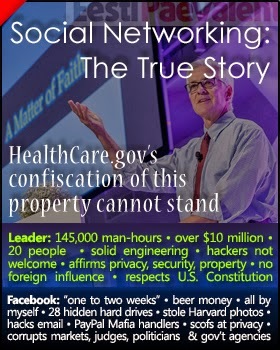 Serco runs the U.S. Patent and Trademark Office! Do you mean to tell me that the U.S. Patent Office is not capable of running itself without foreign help?! American inventors take note: You're screwed. We could not believe this either, but here is Serco’s 2015 press release announcing its deal with Obama. No reasonable person can view the giving away of a vital office to a foreign power as anything but sedition. This alone should get your blood boiling, but it gets much, much worse. 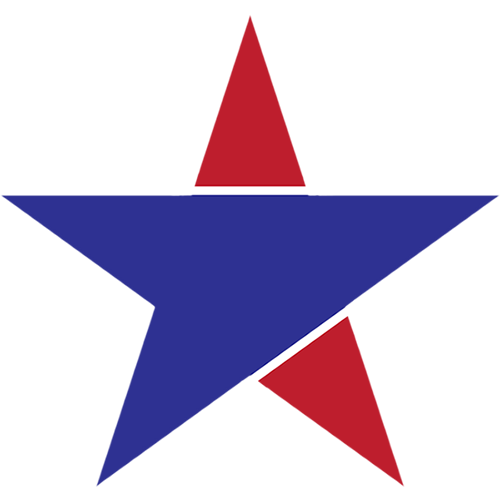 Serco has 11 contracts with the U.S. Army, Navy, SPAWAR, Intelligence, Air Force, Coast Guard, Marines, US Border Patrol as well as the Transportation and Commerce Departments. Serco operates 58 U.S. air traffic control towers! WAT? Isn't this a national security issue? Are Americans not capable of running their own airports?! Serco has major contracts with the FCC, FTC, FAA, DOJ, DOS, DHS, ERO, ICE, GSA, prisons, Pension Benefit Guaranty Corp and they even run U.S. military boot camps. Serco runs major public works in Chicago, Colorado, Los Angeles, San Francisco and Georgia—all Deep State shadow government globalist strongholds. Georgia = IBM. Sweetheart Serco U.S. Honey Pots: "Indefinite Delivery, Indefinite Quantity"
In short, we have ceded great swaths of U.S. infrastructure to this foreign control. Many of the Serco contracts are the most lucrative imaginable. They are “Indefinite Delivery, Indefinite Quantity” contracts (STATED SO in the contracts), meaning they are blank checks for the SES. Here is just a partial list of these lucrative Serco GSA contracts with numerous federal government agencies. What? Are not American companies worthy of such honey pot contracts? More likely, these contracts reveal that America’s corporate borders were overrun long ago. Ask yourself: Why are we giving our sovereignty to the United Kingdom? That is a longer answer that is superbly answered in the just released AIM article: EXPOSED: ALL THE QUEEN’S AGENTS AND CORPORATIONS THAT CONTROL THE WORLD. Serco’s American subsidiary, SI International, Inc. was founded and funded on Oct. 14, 1998 by Chicago bankers with Frontenac Company principals Rodney L. Goldstein formerly with Booz Allen Hamilton, and Jeremy H. Silverman formerly with Bain & Company (Mitt Romney). SI International’s officers included S. Bradford Antle who, according to his Bloomberg biography, was still working for Lockheed Martin, where he was leading Lockheed Martin's Washington Technical Operations with 1,700 employees. Other officers came from the U.S. Intelligence supplier CACI, Inc. and Gen. R. Thomas Marsh came from MITRE Corp. Marsh is SES. On Dec. 28, 2008, Serco Group PLC (UK) bought SI International and renamed it Serco, Inc. aka Serco Services, Inc. and appointed S. Bradford Antle its President. The Lockheed logo on this deal is evident. While Brad Antle was triple-timing employment among SI International, Serco and Lockheed Martin, former FBI Director James B. Comey was General Counsel at Lockheed Martin (2005-2010). James B. Comey: “A Higher Loyalty” 2017-current, FBI 2013-2017, HSBC (UK) 2013, Bridgewater Capital 2010-2013, Lockheed Martin 2005-2010, Attorney General 2003-2005, US Attorney 1996-2003, McGuire Woods 1993-1996, US Senate 1995, US Attorney 1987-1993, Gibson Dunn 1986-1987, other. 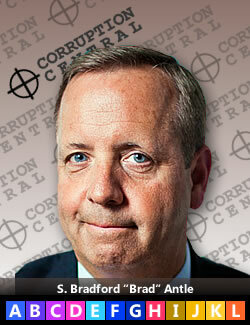 S. Bradford “Brad” Antle: GE 1985-1995, Lockheed Martin 1996-2001, SI International /Serco 1999-2008. Fig. 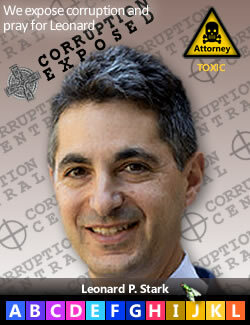 8: Lockheed Martin officers James B. Comey and S. Bradford "Brad" Antle very evidently orchestrated the creation of SI International, Inc. in 1998 to acquire top secret U.S. military contracts that were then sold in 2008 to Serco (UK) who was a partner with Lockheed in AWE Management Limited (Atomic Weapons Establishment)(UK) along with British Nuclear Fuels Limited in which the British Crown has a "Golden Share" and 100% control. This makes all of Lockheed's and Serco's U.S. contracts in an absolute conflict of interest for both British and U.S. interests. In short, both the American and British peoples have been sold out to these globalist transnationalist corporatist entities. Now comes the very sad reality that both Antle and Comey sold out America to the British Crown via Lockheed Martin and Serco. AFI investigators have discovered what looks like hard proof of sedition among Lockheed Martin, Brad Antle and James Comey. On Nov. 10, 1998, AWE Management Limited was incorporated in the United Kingdom by two lawyers who had one share each. 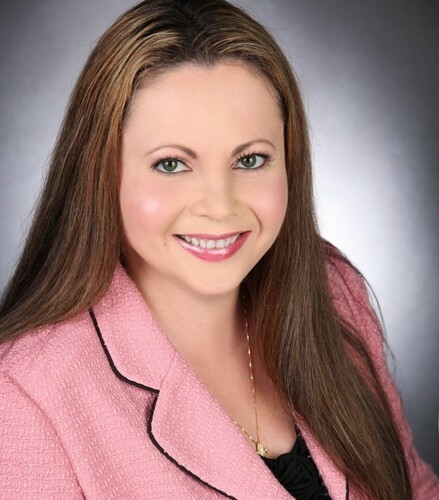 This is a standard way lawyers start companies without involving the founders in order to handle the perfunctory formation paperwork which usually gets amended later. On Dec. 13, 1999, Serco Limited facilitated the updating of the stock to the real owners British Nuclear Fuels Plc (50,000 A shares – Golden Shares controlled by the Crown), Lockheed Martin (50,000 B shares) and Serco (49,998 C shares). Remember, just a year earlier on Oct. 14, 1998 Lockheed’s director S. Bradford Antle had just started Serco’s US predecessor SI International in Chicago. Fig. 9—AWE MANAGEMENT LTD. (Dec. 13, 1999). Ownership Return of Allotment re. Lockheed, Serco and British Nuclear Fuels. Reg. No. 36645711, p. 2. Companies House. Serco and Lockheed Martin hold 2/3rd of the shares in AWE Management Limited (UK). AWE stands for Atomic Weapons Establishment. AWE runs Britain’s nuclear programs for weapons grade materials. The other 1/3rd of AWE shares are held by British Nuclear Fuels Limited (BNFL). Most importantly, the Queen holds a “Golden Share” in AWE and its uranium mining mega supplier Rio Tinto Plc giving her ultimate control. 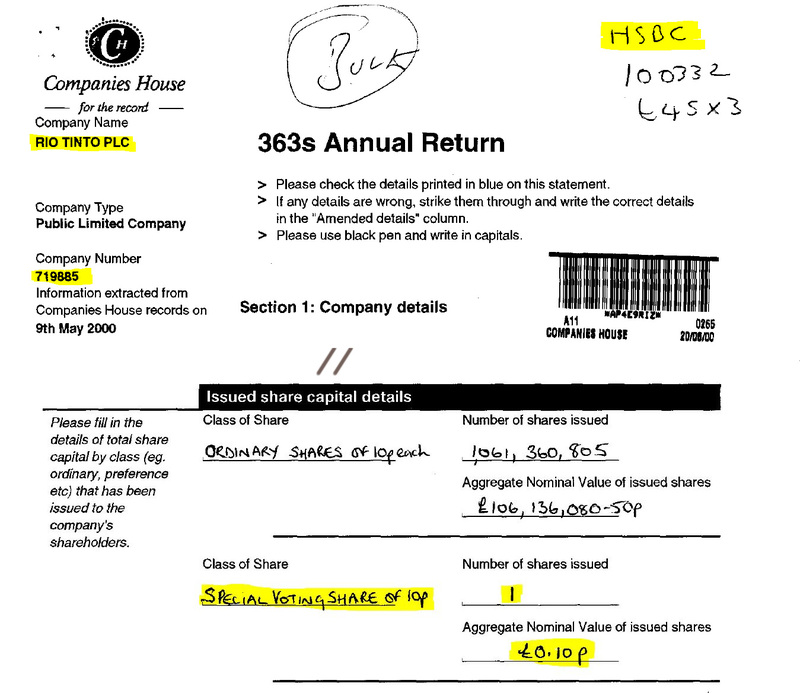 Here is the Queen’s “Golden Share” in Rio Tinto Plc as inauspiciously recorded by hand at Companies House (London, UK) on Dec. 31, 1999, p. 8. Note: When attorneys handwrite disclosures in this day and age, it is generally an intentional act to thwart search engines from being able to index the document, so it is more difficult to find. Fig. 10—Rio Tinto PLC. (Dec. 31, 1999). 2000 Annual Return, Reg. No. 719885. Companies House. Take special note that it appears that HSBC is handling Rio Tinto’s corporate filings. Also note that this filing occurred just 18 days after the On Dec. 13, 1999 AWD Management Limited. 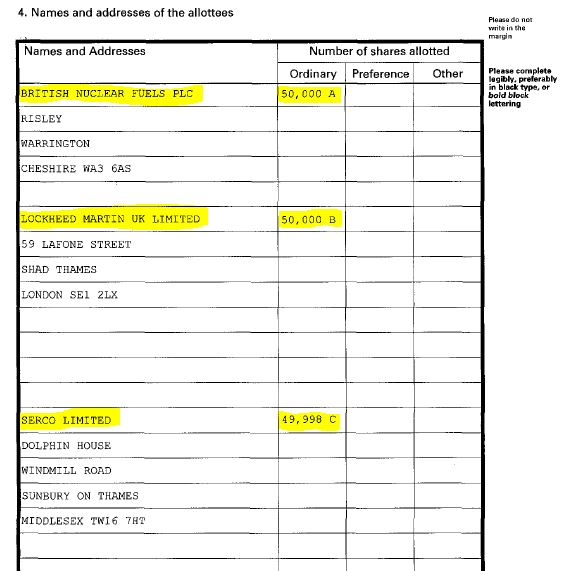 registration of shares that for British Nuclear Fuels, Lockheed Martin and Serco. Now we see HSBC involved in this brew. 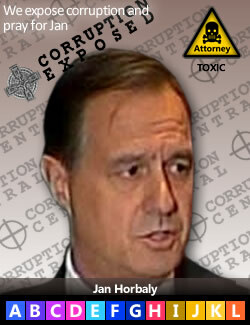 It should be noted again that former FBI Director James B. Comey was chief counsel of HSBC in 2013, being paid about $10 million for less than a year of employment. They did not mention the Queen’s Golden Share that ultimately controls everything having to do with uranium and atomic weapons production in the UK. The Queen, via Rio Tinto, actually sells these companies uranium ore to produce the nuclear fuel—that is enriched in America! So, did the AWE directors check with the Queen before making this deceptive statement? Did the Ernst and Young LLP auditors include this slippery language to give the directors, officers and Crown deniability about their duplicity? The later seems most likely. The auditors probably slaved mightily over this obfuscation. Such material nondisclosures are likely criminal offenses, especially considering the grave national interests involving Britain's nuclear arsenal. Fig. 11—AWE MANAGEMENT LTD. (Dec. 31, 2016). Annual Report and Consolidated Financial Statements. Reg. No. 36645711, p. 34. Companies House. If we are to believe the AWE directors, Lockheed Martin controls the British nuclear program! If we are to believe British Companies House filings, the Queen controls the nuclear program by way of her Golden Shares. Something is horribly wrong with this picture, especially when one adds the Uranium One, Clinton, Putin, Mueller fiasco into the mix. It appears more and more likely that Putin and the Crown were jockeying over control of global uranium mining rights (Rio Tinto vs. Rosatom). Bill and Hillary Clinton knew this, so they played the American card since the Queen's ore is enriched in the U.S. in Eunice, New Mexico. The Queen holds a Golden Share (100% control) of Rio Tinto, that operates numerous mines in Canada. In this scenario, the Uranium One deal appears to have been Bill & Hillary and The Clinton Foundation injecting themselves in the middle to get a piece of the financial action. The Kazakhstan "deal" was probably a sham, a cover, just leverage. Mueller was used as a goat to show the quality of the Eunice, NM processing of the Queen's (READ: Frank Giustra) ore. If the former is true, then British sovereignty over its national security has been ceded to Lockheed Martin. If the latter is true, then America’s national security has been traded away by Lockheed Martin who is managing multiple sets of national interests and is, therefore, sometimes acting against the United States in its dealing with the United Kingdom. Who are the common threads here? Former FBI Director James B. Comey and former Lockheed Martin director of Technical Operations in Washington, D.C. S. Bradford Antle. It is important here to note a longer Serco thread that reaches back almost a century. Serco was founded in 1929 as RCA Services Limited, a UK division of the Radio Corporation of America (RCA). In 1985, General Electric purchased RCA. Two years later in 1987, the UK managers of RCA bought the RCA UK operations and changed the name to Serco in 1988. These events within Serco (UK) occurred right when S. Bradford Antle worked for General Electric (and probably facilitated the sale, with the plan to eventually work for Lockheed, form SI International, then have Serco UK buy in to the US classified business via SI International). These sorts of devious convolutions have come to be expected by our researchers. So more likely, the Queen controls the nuclear activities of both Lockheed Martin and Serco in Britain. This control then walks back to the U.S. via URENCO LIMITED (UK). URENCO manages the U.S. nuclear enrichment plant in Eunice, NM. 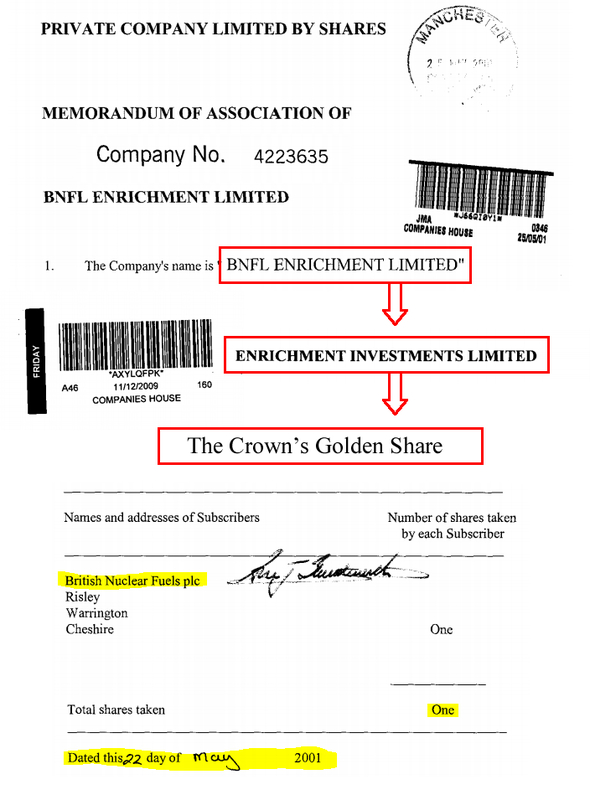 Curiously, in their 2018 annual report, URENCO disguises their British 1/3rd ownership by British Nuclear Fuels Limited (BNFL) and says instead that “Enrichment Investment Limited” (EIL) is the holder. Further investigation shows that EIL is a mere shell front for British Nuclear Fuels Limited. Why the deception? Fig. 12—BNFL ENRICHMENT LIMITED. (May 25, 2001). Certificate of Incorporation of a Private Company, Co. No. 4223635. Companies House. Renamed ENRICHMENT INVESTMENTS LIMITED on Dec. 17, 2009. BNFL is a notorious acronym for British Nuclear Fuels Limited (Plc.). See also ENCRICHMENT INVESTMENTS LIMITED. (Dec. 17, 2009). Memorandum and Articles of Association, Co. No. 4223635. Companies House. ENRICHMENT INVESTMENTS LIMITED is an alias designated on Dec. 17, 2009 for its original name BNFL ENRICHMENT LIMITED formed on May 25, 2001. BNFL is a notorious acronym for British Nuclear Fuels Limited (Plc.). Lockheed’s influence over critical national security organizations on both sides of the Atlantic, including AWE, Serco, SES and OPIC is evident. However, these alliances fold back on each other. It appears that Lockheed Martin sold out the American Republic long ago. We The People just never got the memo. We have two more groups to discuss, then we will swing back around to SES and OPIC. 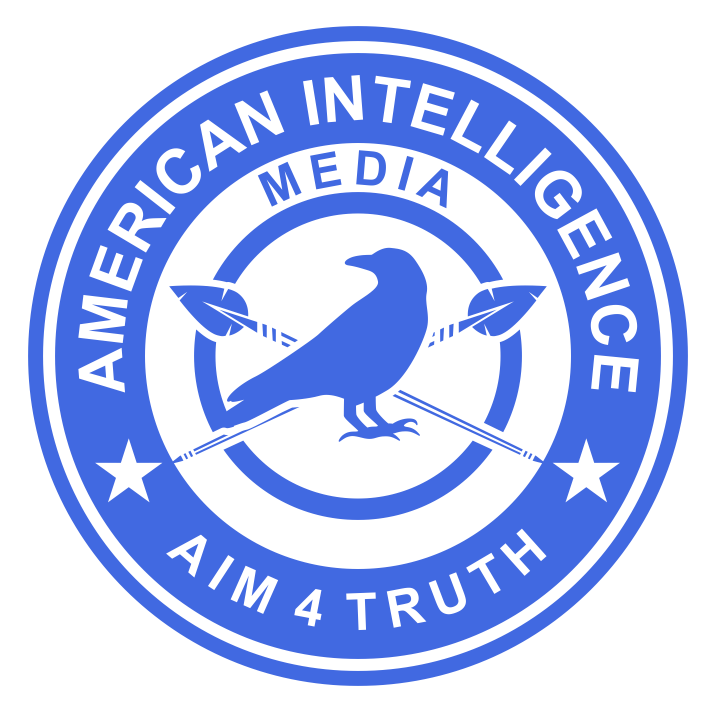 See American Intelligence Media’s new article laying out the history of the Crown Agents. We won’t repeat this superb research here. EXPOSED: ALL THE QUEEN’S AGENTS AND CORPORATIONS THAT CONTROL THE WORLD. This article includes links to actual contracts that USAID pays to Crown Agents, its similar British counterpart. Even our week-long review of government contracts shows that the U.S. government pays tens of billions of dollars a year to Crown Agents USA Washington DC—which is a vassal of the Queen of England. Why do we not hire Americans for this work? This is another example of the corporate borders having been dropped long ago. Hidden inside OPIC are many dozens of contracts with billions of dollars awarded to Citibank. This tie to Wall Street is evident, especially considering that Citigroup was the first merged bank formed after Bill Clinton and Treasury Secretary Larry Summers (with Facebook’s Sheryl K. Sandberg in tow) abolished Glass-Steagal on Nov. 12, 1999. In addition, OPIC funds hundreds, if not thousands, of USAID projects that involve financing sent through the Crown Agents as the prime contractor or supplier to a prime contractor. For example, OPIC provided $100 million in funds and an “Impact Award” to Helios Investment Partners LLC—a creation of the Crown Agents Ltd headquartered in London. Crown Agent Ltd. has only one shareholder – the Crown Agents Foundation. On Jul. 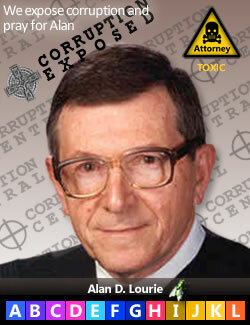 19, 1995, the Crown Agents were “privatized” meaning they became a stock company with a board of directors. The issuance of stock amounts and rights was in the complete control of the Crown’s Secretary of State, and he or she was bound by The Crown Agents Act of 1995. Here is proof that while privatization may sound like the Queen gave up control, she did not. The Crown simply channeled its authority through the Crown’s Secretary of State who controlled the Crown Agents “privatized” successor board of directors. Therefore, the Crown has 100% control of its subsidiary in the U.S. named Crown Agents USA Washington DC. We should note that OPIC is similarly organized as a corporation with the U.S. Secretary of State as its sole shareholder. Also, seven days before Crown Agents was privatized, on Jul. 12, 1995, IBM purchased Lotus Corporation whose collaboration software, Lotus Notes, was planned by the illegal "public-private" Highlands Forum. 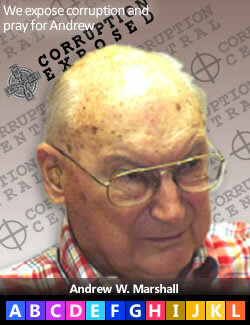 and the DoD Director of Net Assessment—an SES member since 1978 Andrew W. Marshall—to be the platform to be used by the Deep State shadow government to control and spy on Internet communications. At this same time Michael McKibben (who later founded Leader Technologies) was being told by AT&T Bell Labs engineers with whom he was working to create AT&T AccessPlus 3.0 for Windows 95 that Lotus Notes probably could not be made to scale in large Internet transaction volumes. All of the above shows the collusion among SES, OPIC and the Crown Agents. 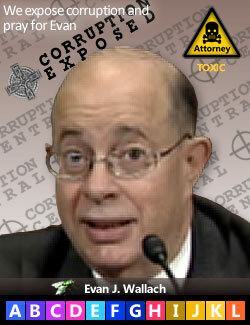 In conclusion, we have tried to introduce the primary caves in this labyrinth of global corruption. These caves lead us back to the beginning of our investigation—into the people and organizations who stole Leader Technologies’ social networking invention to promote their globalist One World agenda. The rogue C.I.A. (interestingly, headquartered in CERN, Switzerland), in collusion with Lockheed Martin, appear to be the intelligence arm of this globalist corporate takeover. The American Republic can survive this, if we acknowledge what is going on and do something about it. In addition, write the Miller Act Notice check to Leader Technologies for 18 years of unpaid use of their revolutionary social networking invention. This will generate new cash streams to free up our economy from the globalist stranglehold. This will also empower Leader Technologies and other actually creative people in America to fix our foundering ship of state. See Leader proposes trillion dollar fed revenue while lowering taxes. Keep up the good work and Godspeed. We’re praying for you and your family. Return to the paragraph where I jumped to this Footnote.